Borrowing jewelry from companies is a common practice among celebrity stylists -- almost 100% of the jewelry that you see worn on red carpets these days was borrowed and will later be returned. 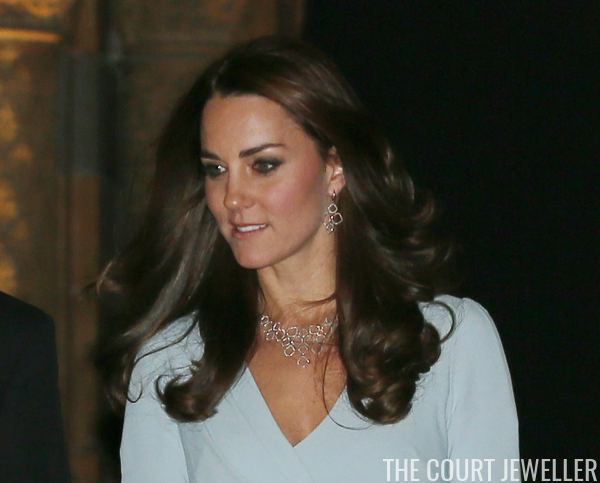 And according to one London jewelry designer, the Duchess of Cambridge has jumped on the borrowed-jewels train, too. In an interview with the Daily Mail's Kerry Potter, Monica Vinader reveals that the brand's diamond necklace and earrings, worn by Kate at a photography awards ceremony at the Natural History Museum in London in 2014, were quietly sent to Kate's team by the company's PR reps. She notes, "I knew nothing about it as my press team had lent them to her people and they’d told them to tell no one else in the company." 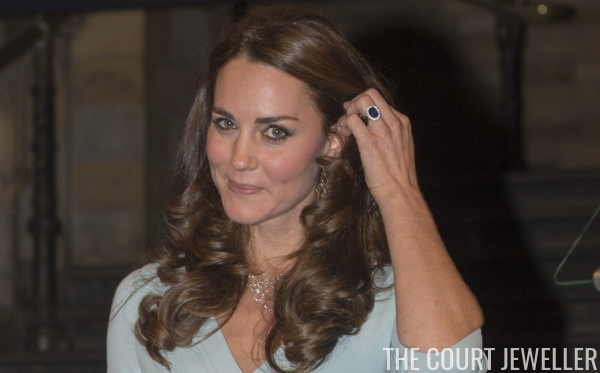 We don't know whether Kate did subsequently purchase the set -- Vinader only reveals that she was "thrilled" when she learned that Kate wore her pieces. 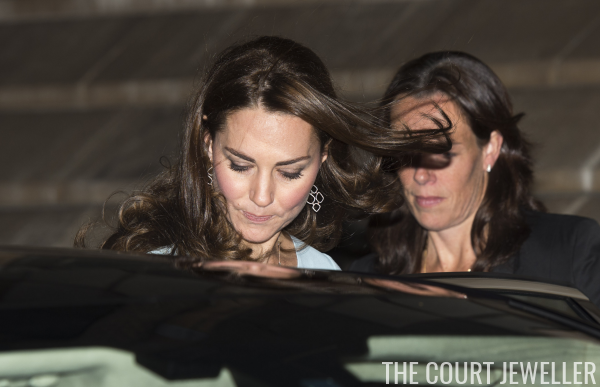 But Kate hasn't worn the Riva earrings or necklace in public since. (And the earrings would have fit right in with the jewelry aesthetic of last month's tour of India.) Whether or not Kate acquired these pieces for her collection, the loan was a great business move for Vinader, who sold tons of similar pieces after Kate was photographed wearing them. Before anyone suggests that Kate's doing something unprecedented, it's important to note that royals have been wearing (and returning) borrowed jewels for decades. Princess Grace of Monaco famously wore a borrowed ruby tiara from Van Cleef and Arpels at Versailles in the '70s; she also wore a borrowed diamond tiara from the firm which has since been worn in movies. Queen Rania of Jordan has borrowed, worn, and returned jewelry from firms like Boucheron. Crown Princess Mary's Midnight Parure is on a long-term exclusive loan from Ole Lynggaard. And even Princess Diana wore borrowed jewels from companies like Collingwood and Garrard. 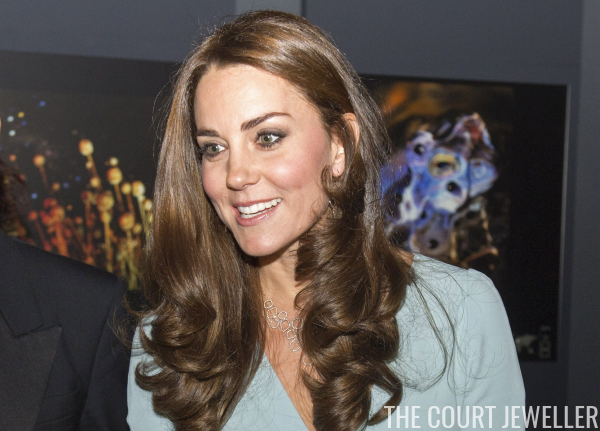 How do you feel about royals wearing borrowed jewels?